The Perth Mint has issued two coins exclusively for the Beijing International Coin Exposition. 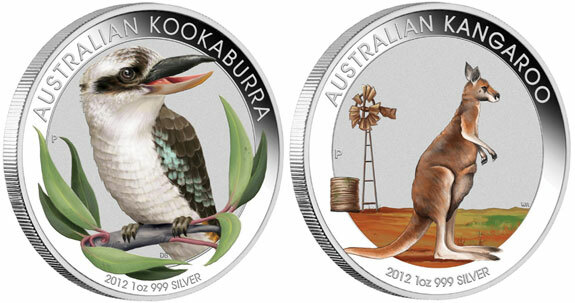 The 1 oz 99.9% pure silver coins feature colored depictions of the Australian Kookaburra and Kangaroo. The design for the Kookaburra coin features a full color depiction of the distinctive Australian bird perched on a tree branch with gum leaves. The inscriptions around the outer rim include “Australian Kookaburra” and “2012 1 oz 999 Silver”. The Kangaroo coin depicts in full color an adult kangaroo set against a colored outback scene with windmill. The inscriptions read “Australian Kangaroo” and “2012 1 oz 999 Silver”. The obverse design of each coin features the Ian Rank-Broadley effigy of Queen Elizabeth II with inscriptions “Elizabeth II”, “Australia”, and the legal tender denomination “1 Dollar”. Both coins are struck in 99.9% pure silver with a weight of 31.135 grams and diameter of 40.60 mm. Each coin comes in 2012 Beijing International Coin Exposition packaging, which consists of a colored, slide out display card and outer shipper. The Perth Mint has indicated that no more than 5,000 of each coin will be released in this packaging. For additional information or to place an order for either of the coins, please see the Perth Mint website recent releases section.